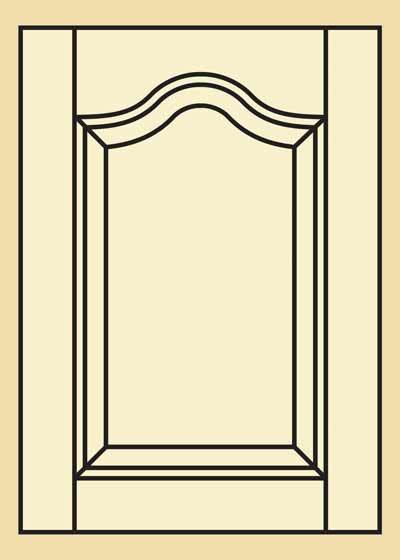 Premium Quality Raised Panel Hard Maple Kitchen Cabinet Door - Cathedral Style 201. Hard Maple is light in color and is a wonderful wood choice when a brighter room is desired. Our Hard Maple kitchen cabinet doors have creamy white to rich reddish brown heartwood and the sapwood color is pale to creamy white. Hard Maple generally has straight, fine grain and finishes very well. This Hard Maple cathedral style kitchen cabinet door provides a great look to your kitchen cabinet or vanity. Each raised panel kitchen cabinet door is manufactured slowly and carefully using only premium lumber. Our wood cabinet doors add beauty and value to every home and also make great vanity doors.